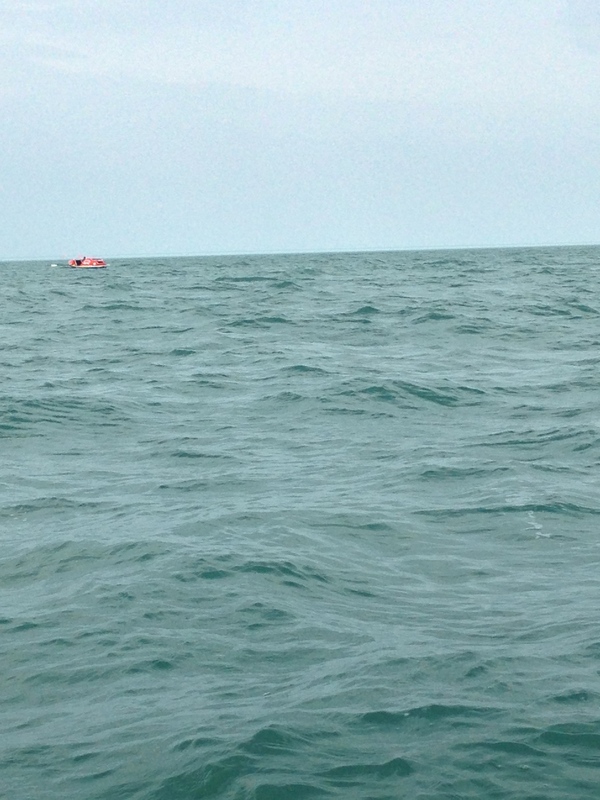 Last Tuesday we drove my little orange boat onto a huge green ship, called Oberon, and waved goodbye as we left her there. Oberon sailed that evening, headed for LA via the Panama Canal. The next time I see my little boat will be when we meet her at the other end, ready to drive her up the coast to Monterey. I can’t wait! 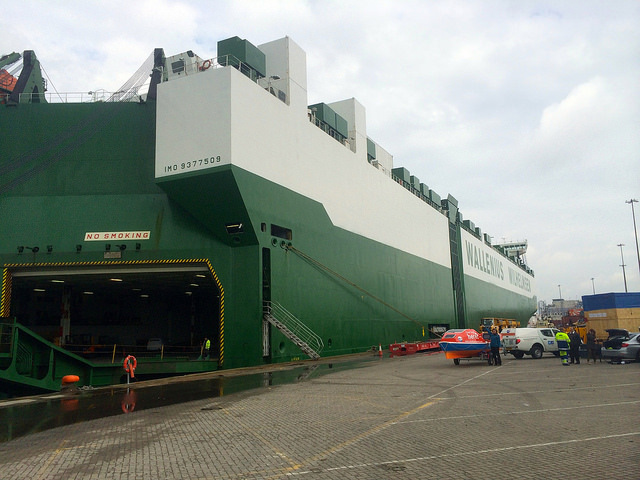 Shipping can be an expensive business, but I’m hugely lucky to be sending the boat courtesy of shipping company Wallenius Wilhelmsen Logistics. 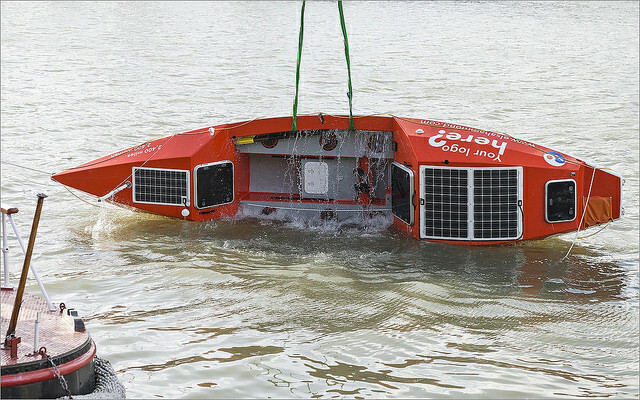 They are a great company to be working with, particularly as their vessels are eco-friendly and fuel efficient, and they are able to deliver quicker than all the other options we had looked into. Their remit is to “deliver innovative and sustainable global shipping and logistics solutions for manufacturers of cars, trucks, heavy equipment and specialized cargo.” Wallenius Wilhelmsen has been absolutely brilliant to me, and I look forward to seeing my boat safely delivered at the other end. Thank you so much to everyone who came to this event at MShed on Wednesday 2nd April – it was brilliant to see so many familiar faces, as well as some new ones. 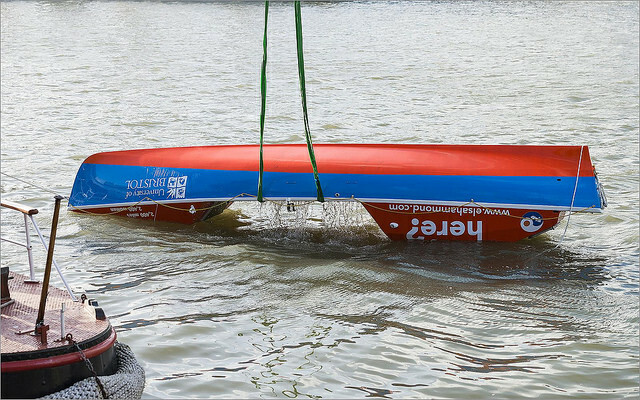 We ran another in a series of capsize tests and held a fundraising auction. Some very generous sponsors, along with some very generous bidders! Items included a fully kitted out bicycle from Bike UK, First Class treatment from Bristol Airport, some pampering goodies from Lush, cases of wine from Naked Wines, Luxury Car Weekend Rental from AMT Vehicle Rental, some generous individual donations, and a fantastic painting by Dirk Larsen. We have also been donated a wonderful holiday in the Isles of Scilly by Tresco Island, which will be up for auction soon! Huge thanks again to everyone who helped and supported – I really appreciate it. 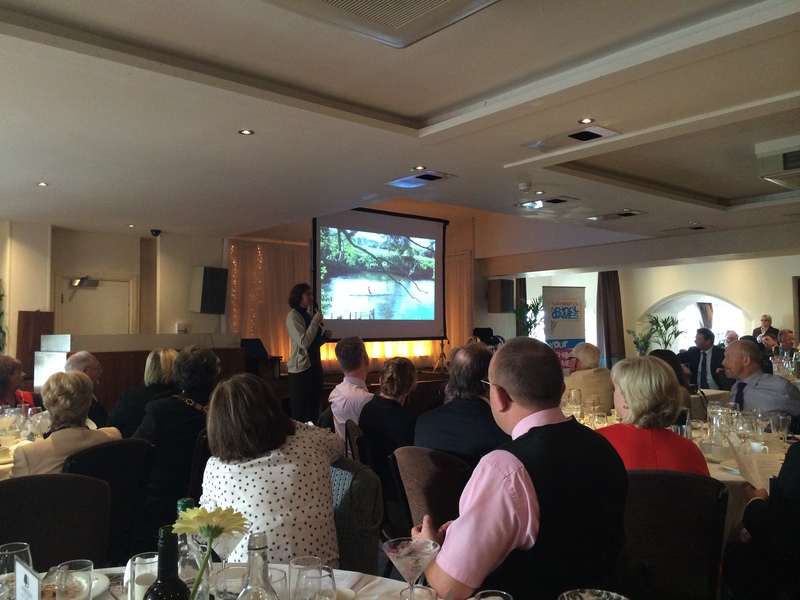 Thanks also to MShed and Business West who made it possible. This weekend was boat boat boat! 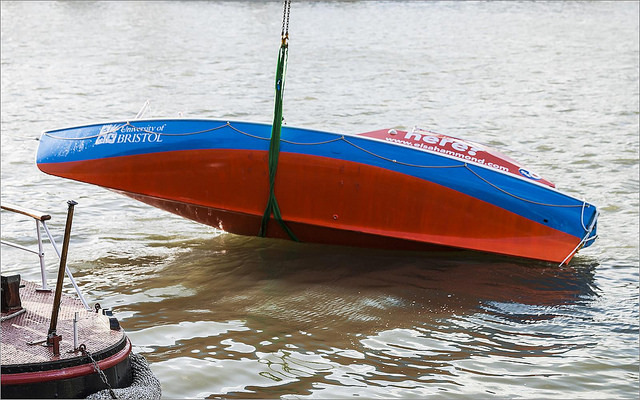 On Saturday we headed down to see Justin at the SeaSabre workshop to get some of the final things fitted on the boat. Liferaft straps, Jetboil holder, new (longer) seat rails, and various other straps and attachments all went in. Only a couple more bits and pieces to go on in Monterey (plus a lot of food and kit), and she’ll be ready to go! Sunday was a water day. 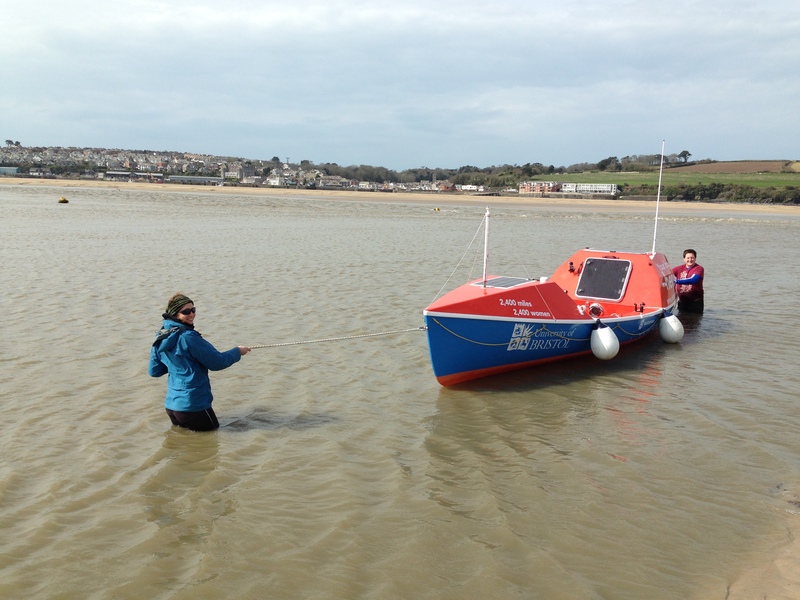 Battling an unusually low tide near Padstow, we made it out with both boats and everyone still intact, though rather wet. 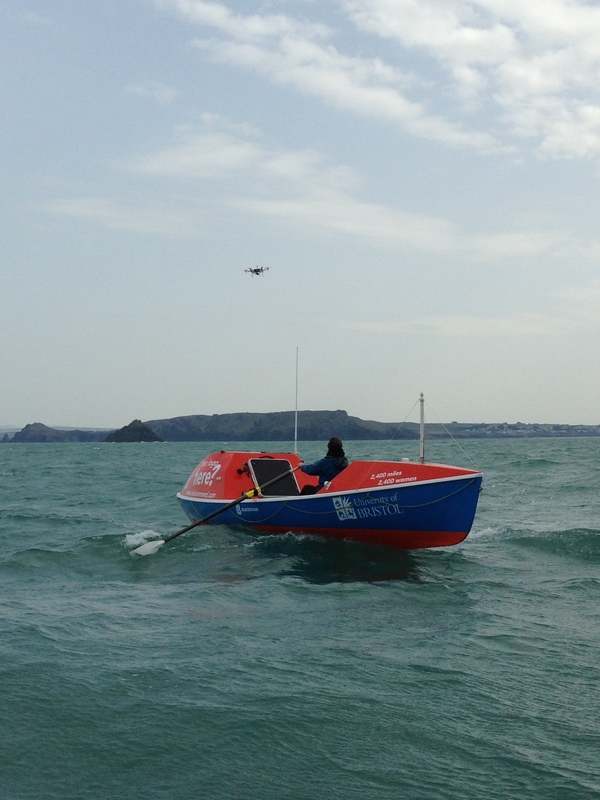 I got some rowing training in while some super clever friends in the other boat managed to do some aerial filming of the boat using a GoPro attached to a hexacopter. Scroll right down to the bottom of the page for the video. 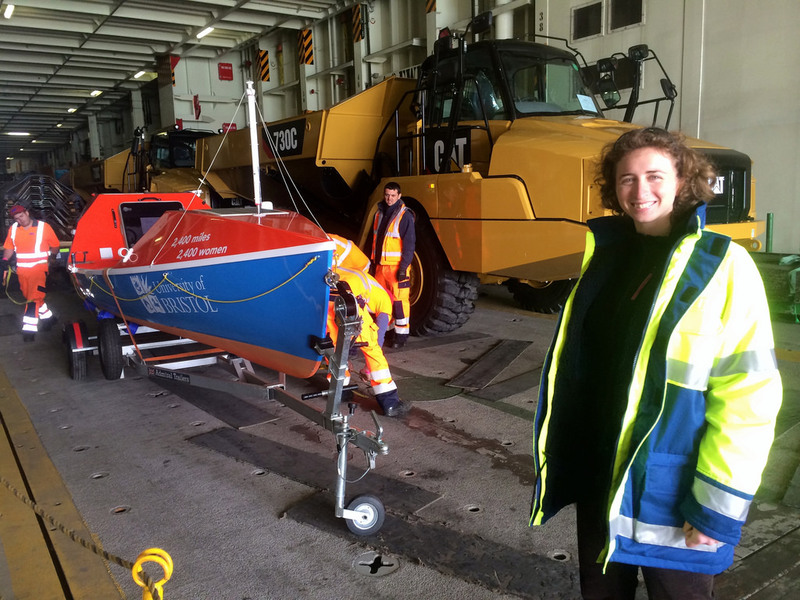 It’s really great to be starting to get a feel for the boat now – I can’t wait to get out there! When I was speaking at the Winter School Games, I met Councillor Alan McMurray of North Somerset Council. He was really interested in my row, and invited me to speak at a Civic Lunch celebrating community sport in North Somerset. I was pretty chuffed to be speaking alongside an Olympian and a Great Britain gymnastics champion. It was a lovely event – despite feeling exhausted from being out training with the boat the night before – and there were some great questions from the audience. 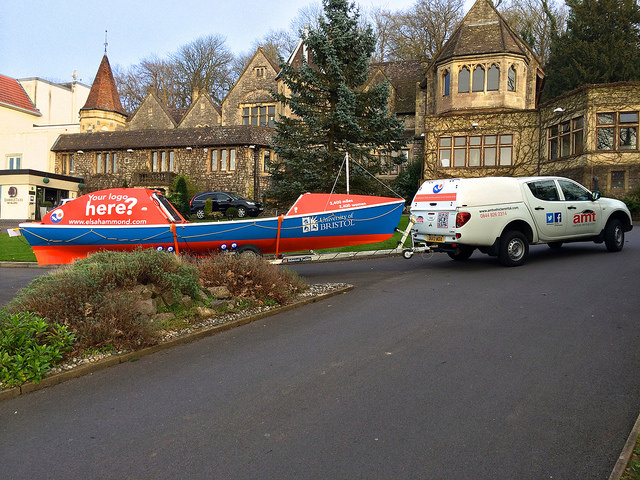 I had the boat with me, so we positioned it outside the hotel so that people could have a look at it afterwards. It made quite an impression! What an honour to get to give a TEDx talk! This was a really exciting event, and particularly as it also fell on International Women’s Day (it was a busy day – Downside in the morning and TEDx in the afternoon). I was hugely nervous before it. I think I’d built up the idea of ‘TED’ and how the talk needed to be in my head, after watching ‘classic’ polished TED talks. I fretted and worried in the lead up to it, but found I was able to relax into it on the day. 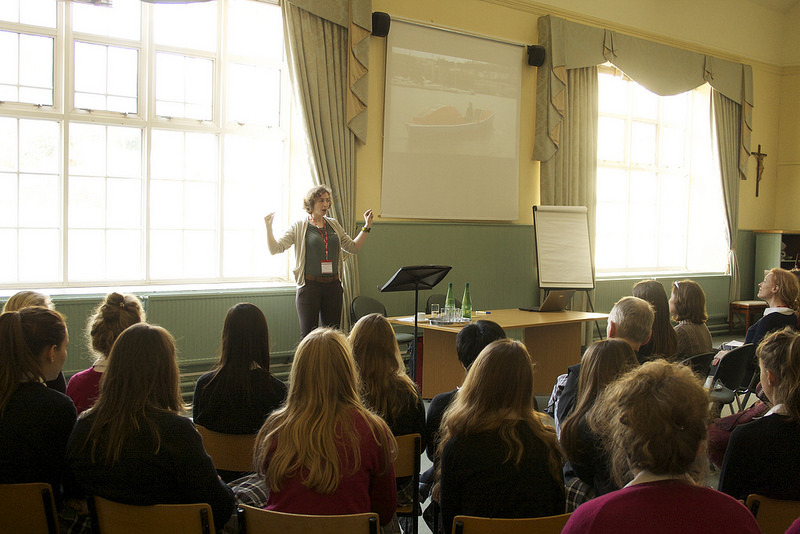 I saw the variety of talks that people were giving, and realised that there is no ‘one’ way of giving a TEDx talk. Mine was just my version. The title of my talk was ‘Why row 2,400 miles across the Pacific Ocean, alone?’ I’d decided to focus on that question that I get asked the most – why? – and this was a really fruitful way into attempting to convey why I am determined to do this slightly crazy thing. Check out the video if you’d like to see what I said! International Women’s Day falls on the 8th March every year, and has been observed in some form for over 100 years. 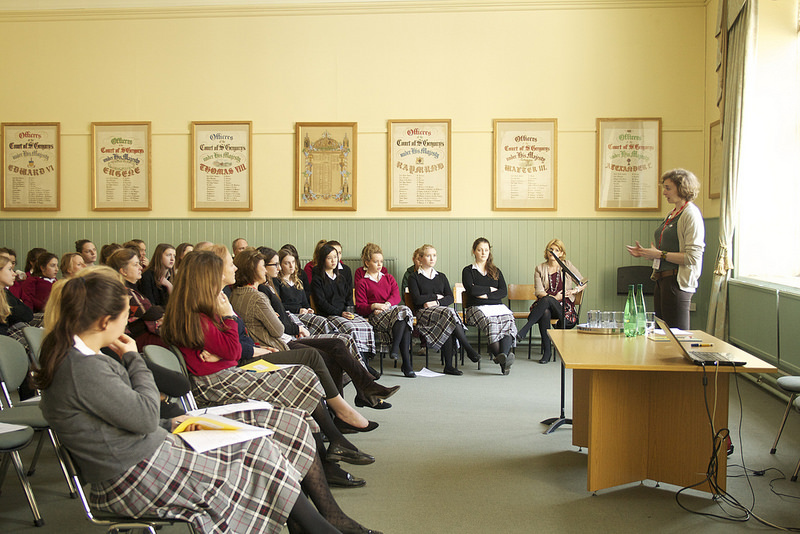 I was invited to speak at Downside School to mark International Women’s Day. 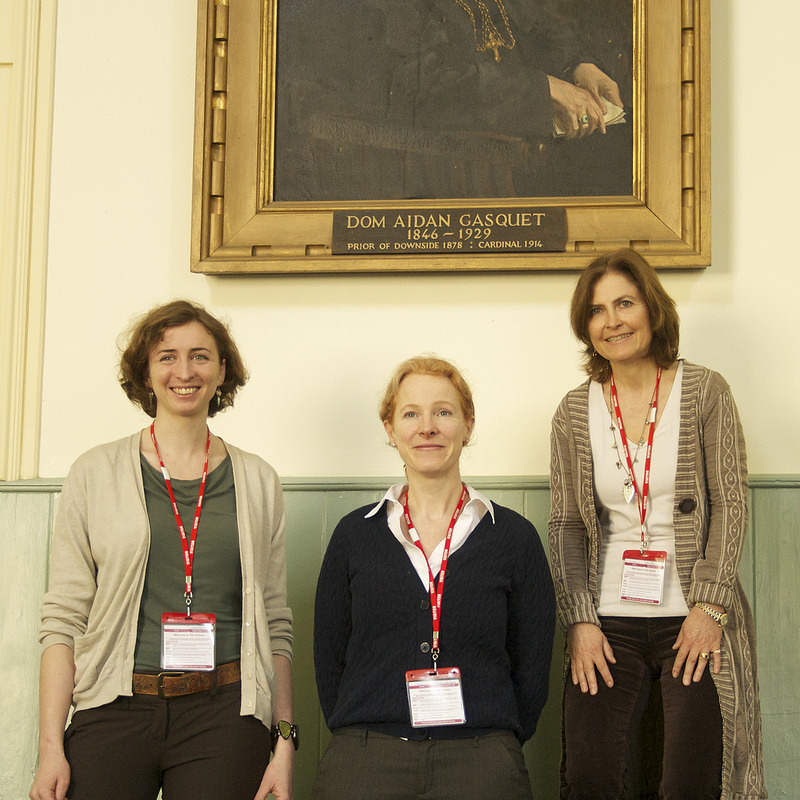 I was in the distinguished company of author Maria Farrer and academic Dr Bruna Gushurst-Moore – who both gave really thought-provoking talks. Yet again, the questions at the end of my talk were what really made it for me, and I was pleased to have a real range of thoughtful questions. I also ran into an old friend from university who is now working at Downside, which was a lovely surprise in a very busy day!